up a new business leads account enter your zip code & click next! It's important for agents to understand one thing when it comes to selling final expense, it's a slow process. You can not just start buying a ton of leads and expect that, vwualla, your a successful agent. You can however get a bunch of leads very quickly and get your business going. On that note however, it is of utmost importance that you build a foundation for your self and become the number one life insurance agent of your aria, This holds true for both small town and big town settings. A good way to accomplish this is to stay open and work with all ages. This may seem counter intuitive because the fact is seniors are your easiest target for marketing, because they are the ones who respond the most to final expence leads. This is because usually they are more interested, and more concerned about things like funeral cost and such. What many agents don't realize is that you can also sell final expense insurance to younger family members. Subsequently if you also offer other products like universal life insurance , whole life insurance , term life insurance , basically the importance insurance types to meet all the different needs of various individuals, your going to be able to build a strong foundation. This foundation is the very thing you will need to as an agent so that you are able to build your name, gain recognition and get constant referrals. This help ensure that your not always trying to find the quick lead but building a trusted brand amongst existing and future clients. It's really no different than any other business in that the most important thing is to have a strong foundation. So how do you start building this foundation. Well first your going to need some clients and you have non, and like most just starting out you probably don't have much money. 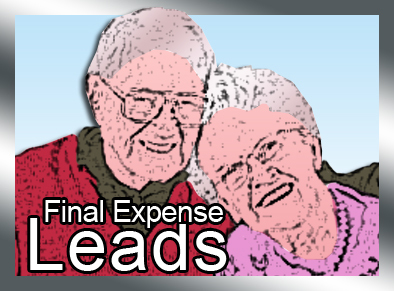 A great way to start is with aged final expense insurance leads. These aged leads will allow you to get a huge volume of quality leads at a very low cost. Also get some business cards and start handing them out to everyone. Market your self as the king of insurance or what have you. State that you offer insurance to everyone, regardless of age or conditions. The point being everyone needs just a little bit of insurance, and you want to be able to provide it. If perspective clients know they can call you no matter what, they will! This technique is a sure fire way to reach a level of income that is comfortable. Lets just consider $50k a year. This is on the low side for even a moderately successful final expense insurance agents but non the less a great income for most people. If you consider that while know that you will be your own boss and you will only have to work an average of 3 days out of the week then this industry suddenly becomes very appealing. In reality final expense insurance is a really easy product to sell. Unlike so many products out there final expense is actually needed, and always in demand on it's own. This holds true for all other forms of life insurance as well but more so for final expense which is really another word for life insurance just specified to specific genera of coverage for seniors. If your interested is being successful in the life insurance industry, final expense is a great place to start and a great place to stay. But no one is going to know your an agent if you don't tell them, so get a billboard, put signs on your car, get business cards made up and send out fliers. Get on the phone and connect with perspective clients directly by utilizing the availability of final expense leads. Most important of all build your self up to be the premier provider of life insurance in your aria, the go to guy for all things life insurance. Follow this formula and you'll surly be on your way!